Adrian Gonzalez and Carl Crawford will forever be linked in New England. On Friday afternoon, I hopped on a bus from my seaside studio apartment in New Bedford for Boston, typically a 90-minute journey thanks to rush-hour traffic. As usual, I had my headphones (and Sandinista! by The Clash) and a book (For Whom the Bell Tolls by Ernest Hemingway), and just as the bus was pulling out of the station I pulled out my phone to see what the internet was up to. And my side of the internet was quite engaged in the possibility of a baseball trade that seemed to be pulled from a nutjob radio caller’s brain: Adrian Gonzalez, Carl Crawford, Josh Beckett and, for reasons that will always be funny, Nick Punto were on their way to Los Angeles for first baseman James Loney and four minor leaguers. 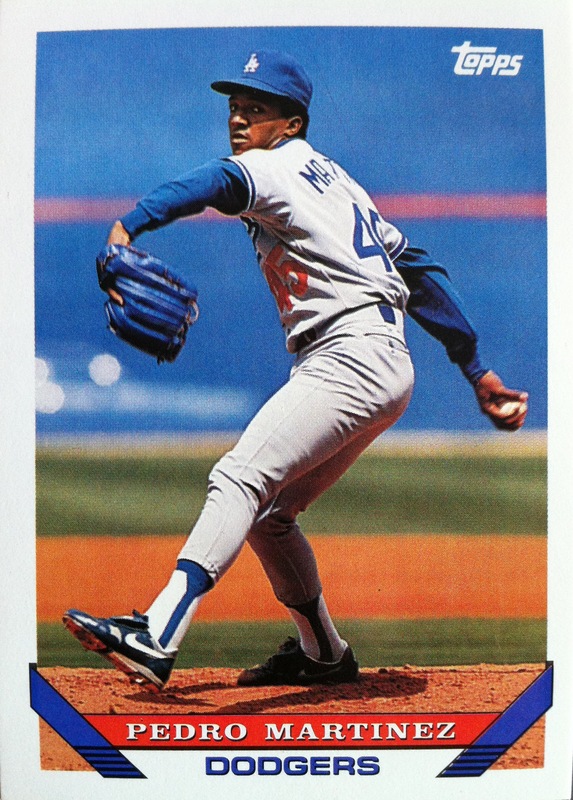 It’s been a solid week of love letters, essays and expositions on Pedro Martinez, that Dominican Dandy with three masterful pitches and a flair for the dramatic. 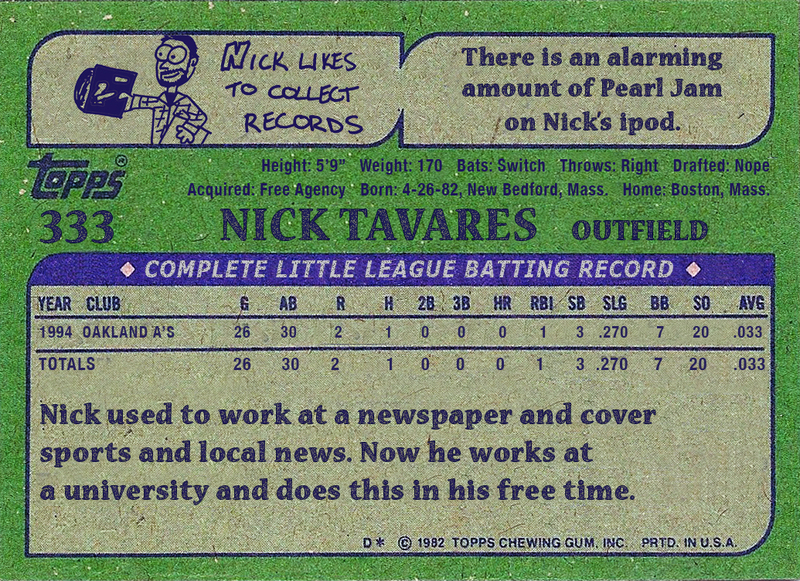 His numbers can be perused, of course, on websites and the backs of baseball cards. But I wanted another way to look at them while paying homage to his outstanding career. 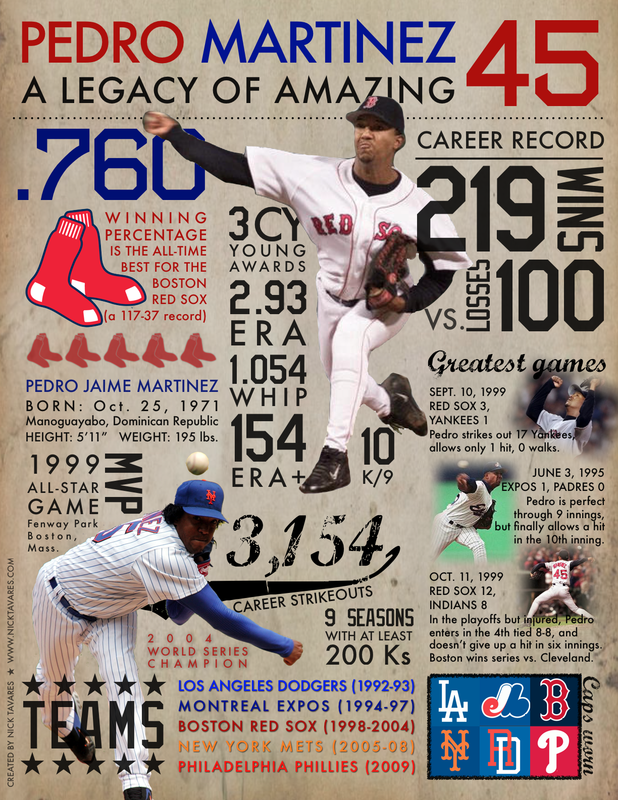 So, please enjoy my graphic interpretation of Pedro Martinez, from Los Angeles to Philadelphia and all the stops, wins and records between. Click through for the full-size. And long live the memory of Pedro Martinez, from bean balls to strikeouts, from losses to wins. And thank you all, dear readers, for tuning in for Pedro Week. Dodgers manager Tommy Lasorda didn't think Pedro could handle pitching out of the rotation. 1993 was easily my heaviest year of baseball fandom to that point. I was 11 years old, fully in love with the Boston Red Sox, and beginning to exhaustively study the history of the game. I worked to memorize World Series winners and losers, MVPs, Cy Young winners, batting champs and Rookies of the Year. I spent my time in the library making photo copies of baseball players from books with dimes I’d saved up — Dave Winfield, Pete Rose, Tom Seaver, Carl Yastrzemski, Brooks Robinson, and on down the line. And, of course, there were baseball cards. I bought packs of Fleer, Fleer Ultra and Upper Deck that year, but I concentrated mainly on Topps. By then, I’d realized that Topps was the only company that would print the entire career of a player on the card backs, and being the student of the game I was, it was a big draw.